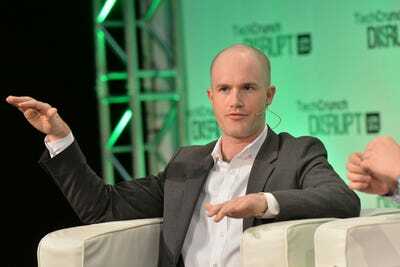 Anthony Harvey/Getty Images for TechCrunchCoinbase CEO Brian Armstrong. Coinbase said on Tuesday evening (US eastern time) that users wouldn’t be able to buy and sell bitcoin cash four hours after it said trading of the cryptocurrency would be enabled on its platforms. CEO Brian Armstrong said the company is looking into whether employees tried to profit from advanced knowledge of the news. Bitcoin cash is a spin-out cryptocurrency of bitcoin that was created in August. Coinbase, one of the largest cryptocurrency trading platforms, shocked the crypto-world with its announcement Tuesday evening, US eastern time, that it would allow users to buy and sell bitcoin cash. The news sent bitcoin cash, the spin-off cryptocurrency of bitcoin launched in August, to an all-time high above $US3,609per data from Markets Insider. On Coinbase’s GDAX platform, the price of the cryptocurrency reached well above $US8,000 per coin. That appreciation began slightly before the announcement on some exchanges, raising concerns about the possibility of insider trading by employees with advanced knowledge of the news. Coinbase CEO Brian Armstrong said in a post early Wednesday morning that the company was looking into the matter. The price spike appeared to put pressure on Coinbase. Nearly four hours after the San Francisco-based firm announced it was supporting bitcoin cash trading, it said users wouldn’t be able to buy and sell the cryptocurrency until Wednesday. In addition to bitcoin cash spiking by almost $US1,000, cryptocurrency trading volumes reached an all-time high above $US49 billion, according to data from CoinMarketCap. Coinbase has struggled to fully function under such demand in the past. On December 12, the company halted trading of litecoin and ether as the two cryptocurrencies reach all-time highs.